Moisture overriding associated with rainbands. Where relatively warm water bodies are present, for example due to water evaporation from lakes, lake-effect snowfall becomes a concern downwind of the warm lakes within the cold cyclonic flow around the backside of extratropical cyclones. Lake-effect snowfall can be locally heavy. Thundersnow is possible within a cyclone's comma head and within lake effect precipitation bands. In mountainous areas, heavy precipitation is possible where upslope flow is maximized within windward sides of the terrain at elevation. On the leeward side of mountains, desert climates can exist due to the dry air caused by compressional heating. 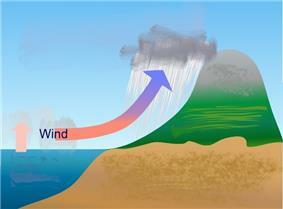 The movement of the monsoon trough, or intertropical convergence zone, brings rainy seasons to savannah climes. ^ "Precipitation". Glossary of Meteorology. ^ a b Dr. Chowdhury's Guide to Planet Earth (2005). 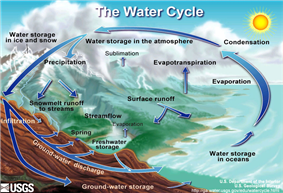 "The Water Cycle". WestEd. Retrieved 2006-10-24. ^ a b Dr. Jim Lochner (1998). "Ask an Astrophysicist". ^ Emmanouil N. Anagnostou (2004). "A convective/stratiform precipitation classification algorithm for volume scanning weather radar observations". Meteorological Applications (Cambridge University Press) 11 (4): 291–300. ^ A.J. Dore, M. Mousavi-Baygi, R.I. Smith, J. Hall, D. Fowler and T.W. Choularton (June 2006). "A model of annual orographic precipitation and acid deposition and its application to Snowdonia". Atmosphere Environment 40 (18): 3316–3326. ^ a b Robert Penrose Pearce (2002). Meteorology at the Millennium. Academic Press. p. 66. ^ Robert A. Houze, Jr. (1994-06-28). Cloud Dynamics. Academic Press. p. 348. ^ Jan Jackson (2008). "All About Mixed Winter Precipitation". ^ Glossary of Meteorology (June 2000). "Dewpoint". ^ FMI (2007). "Fog And Stratus - Meteorological Physical Background". Zentralanstalt für Meteorologie und Geodynamik. Retrieved 2009-02-07. ^ Glossary of Meteorology (2009). "Adiabatic Process". ^ TE Technology, Inc (2009). "Peltier Cold Plate". Retrieved 2008-12-27. 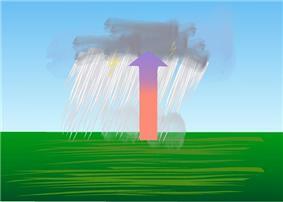 ^ Glossary of Meteorology (2009). 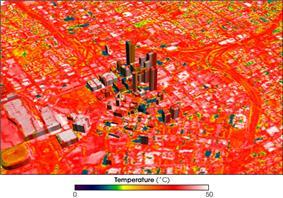 "Radiational cooling". ^ Robert Fovell (2004). "Approaches to saturation" (PDF). ^ Bart van den Hurk and Eleanor Blyth (2008). "Global maps of Local Land-Atmosphere coupling" (PDF). KNMI. Retrieved 2009-01-02. ^ H. Edward Reiley, Carroll L. Shry (2002). Introductory horticulture. Cengage Learning. p. 40. ^ a b Dr. Michael Pidwirny (2008). "CHAPTER 8: Introduction to the Hydrosphere (e). 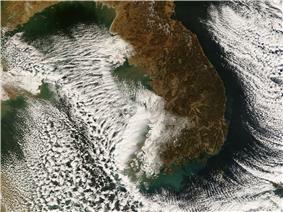 Cloud Formation Processes". Physical Geography. Retrieved 2009-01-01. ^ Paul Sirvatka (2003). 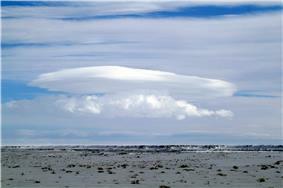 "Cloud Physics: Collision/Coalescence; The Bergeron Process". ^ a b c d J . S. 0guntoyinbo and F. 0. Akintola (1983). 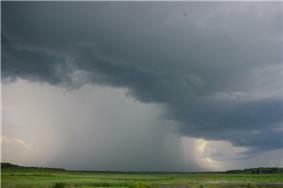 "Rainstorm characteristics affecting water availability for agriculture" (PDF). IAHS Publication Number 140. Retrieved 2008-12-27. ^ Norman W. Junker (2008). "An ingredients based methodology for forecasting precipitation associated with MCS's". ^ a b c d e Alaska Air Flight Service Station (2007-04-10). "SA-METAR". ^ Weatherquestions.com. 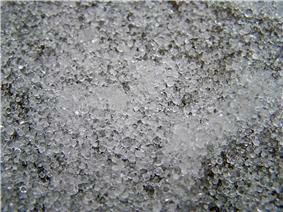 "What causes ice pellets (sleet)?". Retrieved 2007-12-08. ^ Glossary of Meteorology (2009). "Hail". ^ Ryan Jewell and Julian Brimelow (2004-08-17). "P9.5 Evaluation of an Alberta Hail Growth Model Using Severe Hail Proximity Soundings in the United States" (PDF). Retrieved 2009-07-15. ^ National Severe Storms Laboratory (2007-04-23). "Aggregate hailstone". ^ Julian C. Brimelow, Gerhard W. Reuter, and Eugene R. Poolman (October 2002). 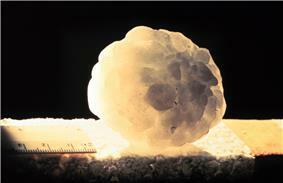 "Modeling Maximum Hail Size in Alberta Thunderstorms". Weather and Forecasting 17 (5): 1048–1062. ^ Jacque Marshall (2000-04-10). "Hail Fact Sheet". ^ a b M. Klesius (2007). "The Mystery of Snowflakes". National Geographic 211 (1): 20. ISSN 0027-9358. ^ William J. Broad (2007-03-20). "Giant Snowflakes as Big as Frisbees? Could Be". New York Times. Retrieved 2009-07-12. ^ Jennifer E. Lawson (2001). Hands-on Science: Light, Physical Science (matter) - Chapter 5: The Colors of Light. Portage & Main Press. p. 39. ^ Kenneth G. Libbrecht (2006-09-11). "Guide to Snowflakes". ^ John Roach (2007-02-13). No Two Snowflakes the Same" Likely True, Research Reveals""". ^ Kenneth Libbrecht (Winter 2004–2005). 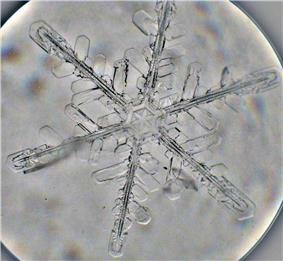 "Snowflake Science" (PDF). American Educator. Retrieved 2009-07-14. ^ Glossary of Meteorology (June 2000). "Diamond Dust". ^ a b B. Geerts (2002). "Convective and stratiform rainfall in the tropics". ^ David Roth (2006). "Unified Surface Analysis Manual" (PDF). ^ Glossary of Meteorology (2009). "Graupel". ^ Toby N. Carlson (1991). Mid-latitude Weather Systems. Routledge. p. 216. ^ Diana Leone (2002). "Rain supreme". Honolulu Star-Bulletin. Retrieved 2008-03-19. ^ Western Regional Climate Center (2002). "Climate of Hawaii". Retrieved 2008-03-19. ^ Paul E. Lydolph (1985). The Climate of the Earth. Rowman & Littlefield. p. 333. ^ Michael A. Mares (1999). Encyclopedia of Deserts. ^ Adam Ganson (2003). "Geology of Death Valley". ^ Joan Von Ahn; Joe Sienkiewicz; Greggory McFadden (April 2005). "Hurricane Force Extratropical Cyclones Observed Using QuikSCAT Near Real Time Winds". Mariners Weather Log (Voluntary Observing Ship Program) 49 (1). Retrieved 2009-07-07. ^ Owen Hertzman (1988). "Three-Dimensional Kinematics of Rainbands in Midlatitude Cyclones Abstract". PhD thesis. ^ Yuh-Lang Lin (2007). Mesoscale Dynamics. Cambridge University Press. p. 405. ^ B. Geerts (1998). "Lake Effect Snow.". ^ Greg Byrd (1998-06-03). "Lake Effect Snow". ^ Karl W. Birkeland and Cary J. Mock (1996). "Atmospheric Circulation Patterns Associated With Heavy Snowfall Events, Bridger Bowl, Montana, USA" (PDF). Mountain Research and Development (International Mountain Society) 16 (3): 281–286. ^ Glossary of Meteorology (2009). "Rainy season". ^ Costa Rica Guide (2005). "When to Travel to Costa Rica". ToucanGuides. Retrieved 2008-12-27. ^ Michael Pidwirny (2008). "CHAPTER 9: Introduction to the Biosphere". PhysicalGeography.net. Retrieved 2008-12-27. ^ Elisabeth M. Benders-Hyde (2003). "World Climates". Blue Planet Biomes. Retrieved 2008-12-27. ^ Mei Zheng (2000). "The sources and characteristics of atmospheric particulates during the wet and dry seasons in Hong Kong". ^ S. I. Efe, F. E. Ogban, M. J. Horsfall, E. E. Akporhonor (2005). "Seasonal Variations of Physico-chemical Characteristics in Water Resources Quality in Western Niger Delta Region, Nigeria" (PDF). Journal of Applied Scientific Environmental Management 9 (1): 191–195. ^ C. D. Haynes, M. G. Ridpath, M. A. J. Williams (1991). 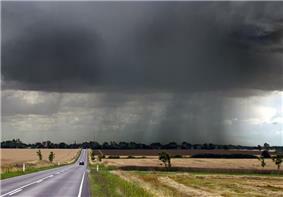 Monsoonal Australia. Taylor & Francis. p. 90. ^ a b Marti J. Van Liere, Eric-Alain D. Ategbo, Jan Hoorweg, Adel P. Den Hartog, and Joseph G. A. J. Hautvast (1994). "The significance of socio-economic characteristics for adult seasonal body-weight fluctuations: a study in north-western Benin" (PDF). British Journal of Nutrition (Cambridge University Press) 72 (3): 479–488. ^ Jack Williams (2005-05-17). "Background: California's tropical storms". ^ "USGS 220427159300201 1047.0 Mt. Waialeale Rain Gage nr Lihue, Kauai, HI". USGS Real-time rainfall data at Waiʻaleʻale Raingauge. Retrieved 2008-12-11. ^ Chris Lehmann (2009). "10/00". Central Analytical Laboratory. Retrieved 2009-01-02. ^ Discovery School (2009). "Build Your Own Weather Station". Discovery Education. Archived from the original on 2008-12-26. Retrieved 2009-01-02. ^ "Community Collaborative Rain, Hail & Snow Network Main Page". Colorado Climate Center. 2009. Retrieved 2009-01-02. ^ The Globe Program (2009). "Global Learning and Observations to Benefit the Environment Program". Retrieved 2009-01-02. ^ Glossary of Meteorology (2009). "Hydrometeor". ^ C. Kidd, G.J. Huffman (2011). "Global Precipitation Measurement". Meteorological Applications, 18: 334–353. ^ F.J. Tapiador, F.J. Turk, W. Petersen, A.Y. Hou, E. Garcia-Ortega, L.T. Machado, C.F. Angelis, P. Salio, C. Kidd, G.J. Hffman M. De Castro (2012). "Global Precipitation Measurement Methods, Datasets and Applications.". Atmospheric Research. 104-105: 70–97. ^ Glossary of Meteorology (June 2000). "Return period". ^ Glossary of Meteorology (June 2000). "Rainfall intensity return period". ^ Boulder Area Sustainability Information Network (2005). "What is a 100 year flood?". Boulder Community Network. Retrieved 2009-01-02. ^ Susan Woodward (1997-10-29). "Tropical Broadleaf Evergreen Forest: The Rainforest". ^ Susan Woodward (2005-02-02). "Tropical Savannas". ^ Michael Ritter (2008-12-24). "Humid Subtropical Climate". ^ Lauren Springer Ogden (2008). Plant-Driven Design. Timber Press. p. 78. ^ Michael Ritter (2008-12-24). "Mediterranean or Dry Summer Subtropical Climate". ^ Brynn Schaffner and Kenneth Robinson (2003-06-06). 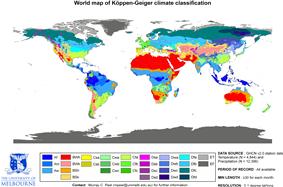 "Steppe Climate". West Tisbury Elementary School. Retrieved 2008-04-15. ^ Michael Ritter (2008-12-24). "Subarctic Climate". ^ Robert Burns (2007-06-06). "Texas Crop and Weather". ^ James D. Mauseth (2006-07-07). "Mauseth Research: Cacti". ^ Climate Change Division (2008-12-17). "Precipitation and Storm Changes". ^ Jack S. Bushong (1999). "Quantitative Precipitation Forecast: Its Generation and Verification at the Southeast River Forecast Center" (PDF). ^ Daniel Weygand (2008). "Optimizing Output From QPF Helper" (PDF). ^ Noreen O. Schwein (2009). "Optimization of quantitative precipitation forecast time horizons used in river forecasts". ^ Christian Keil, Andreas Röpnack, George C. Craig, and Ulrich Schumann (2008-12-31). "Sensitivity of quantitative precipitation forecast to height dependent changes in humidity". Geophysical Research Letters 35 (9): L09812. ^ P. Reggiani and A. H. Weerts (2007). "Probabilistic Quantitative Precipitation Forecast for Flood Prediction: An Application". Journal of Hydrometeorology 9 (1): 76–95. ^ Charles Lin (2005). "Quantitative Precipitation Forecast (QPF) from Weather Prediction Models and Radar Nowcasts, and Atmospheric Hydrological Modelling for Flood Simulation" (PDF). Achieving Technological Innovation in Flood Forecasting Project. Retrieved 2009-01-01.